​2018 Miller, Holly V. and Anthony A. Peguero. (Eds.). 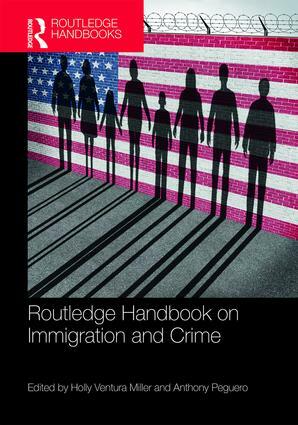 Routledge Handbook on Immigration and Crime. New York, NY: Routledge, 2018 Projected Publication Date. ​The perception of the immigrant as criminal or deviant has a long history in the United States, with many groups (e.g., Irish, Italians, Latinos) having been associated with perceived increases in crime and other social problems, although data suggest this is not necessarily the case. This handbook examines the relationship between immigration and crime by presenting chapters reflecting key issues from both historical and current perspectives. The volume includes a range of topics related to immigration and crime, such as the links between immigration rates and crime rates, nativity and crime, and the social construction of the criminal immigrant, as well as historical and current immigration policy vis-Ã　-vis perceptions of the criminal immigrant. Other topics covered in this volume include theoretical perspectives on immigration and assimilation, sanctuary cities, and immigration in the context of the "war on terror." The Routledge Handbook on Immigration and Crime fills the gap in the literature by offering a volume that includes original empirical work as well as review essays that deliver a complete overview of immigration and crime relying on both historical and contemporary perspectives. It is a key collection for students in immigration courses; scholars and researchers in diverse disciplines including criminal justice, criminology, sociology, demography, law, psychology, and urban studies; and policy makers dealing with immigration and border security concerns. ​2013 Muschert, Glenn W., Stuart Henry, Nicole L. Bracy, and Anthony A. Peguero (Eds.). Responding to School Violence: Confronting the Columbine Effect. Boulder, CO: Lynne Rienner Publishers. The core arguments of this book are that since the Columbine shootings, the development of school antiviolence policy: (1) has been based on fear driven by extreme, low-probability events, such as school rampage shootings; (2) may have unintended negative effects in (a) damaging the school learning environment, (b) undermining relationships among students and teachers, and/or (c) exacerbating the problems of violence that they are intended to alleviate; and (3) distracts from the development of a comprehensive, multilevel approach to deal with the multifaceted causes of the problem. We propose moving beyond Columbine Effect policy.